Edit: Okay, I just saw some of the later videos, so I have to correct what I wrote. Some of the later DVDs in the series are quite high tech and shot from China. They look like they had professional choreographers and makeup artists, and the sound quality is professional. So the following only applies to the other ones we saw. My bad, Mei Mei. For parents trying to teach their kids Chinese, there's a huge selection of Chinese language DVDs out there. My three year old son Gun-Gun has checked out Ni Hao Kai Lan, Language Tree, and a bunch of others, most of which use high tech DVD tricks to create interactive dialogue. Language Tree, for example, asks the children to press buttons on the DVD remote in order to pass little pop quizzes. Ni Hao Kai Lan has stories about children and animals getting along and sprinkles Chinese in with the main English dialogue. These videos are good looking, well produced, and have all kinds of cute animated characters and dialogues. One gets the feeling that they spent a lot of money to bring in experts on language acquisition and child psychology. As the saying goes, "you get what you pay for," so it naturally made sense to my adult mind that the high production DVDs would be the best. 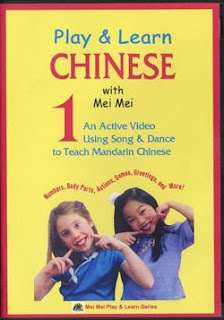 So understandably, I was baffled when I found that my son's favorite Chinese language DVD was not Kai Lan, not Language Tree, not any of these other high budget productions, but an obscure series called Mei Mei and Me that looks like a home video someone's mother made with a Sony HandyCam in her basement. The Mei Mei series of DVDs is really cheap looking. It looks like Mei Mei herself set up a tripod, shot from a cheap videocamera, and edited in the little videocam window (It's almost as bad as my podcasts, but that's a different issue.). The format is a woman named Mei Mei teaching little kids Chinese nursery rhymes and songs. There are no fancy cartoons, no DVD remote gimmicks, no lessons, drills, or cute characters. They don't even have real music. Just a Chinese woman teaching, smiling, clapping, and singing unaccompanied by an other sound. Mei Mei sings in Chinese and asks the children to repeat. They have a translation flash across the screen, but there's no sing along book or explanation. You just have to pay attention. My son can't get enough of it. He says, "Ba ba, I want to watch the Chinese one." And then he watches and sings. It's wild. I don't get it. I tried (and failed) to convince him that Language Tree was interesting. But he absolutely loves the Mei Mei Hu DVD. He loves watching the kids onscreen repeat after her when she speaks or sings. He loves singing along with it. I don't even think he's aware of the fact that it's low budget. It reminds me of the times I bought him a fancy high-tech toy car only to watch him play with the box. The good news is that he's actually learning something from this DVD, something that doesn't take place with Language Tree or Kai Lan. He actually used his Chinese for the first time the other day with an older woman that we met. Maybe because the woman was human and responsive to him, just like Mei Mei and the kids in the Mei Mei series. Go figure.